This map shows the locations being offered to Amazon for the company's second headquarters. CHICAGO — Mayor Rahm Emanuel and Gov. Bruce Rauner on Friday released 10 sites — eight in the city — being pitched to Amazon in an effort to win a second headquarters by the online giant. The new $5 billion second headquarters would employ at least 50,000 people. An eight-page request for proposals posted online said the tech giant expects to be offered incentives to offset building and operating costs. Those incentives "will be significant factors in the decision-making process," according to the proposal. A WTTW report said Illinois' package includes $2 billion in payroll and construction incentives. Here are the locations, according to a joint statement from the mayor and governor, who had been at odds for much of the year before Amazon announced they were looking for a second home. The Old Main Post Office straddling Congress Parkway has sat vacant since 1996. • "Downtown Gateway District" This district includes "significant space" in the Willis Tower, the Old Post Office that spans the Eisenhower Expressway and development over Union Station, according to the statement. In all, there is 18 million square feet of office space available in five existing buildings and seven development sites, officials said. • "City Center Campus" is "a unique opportunity to become an integral part of Chicago's Loop," officials said. A redevelopment of the James R. Thompson Center site is included, a City Hall source confirmed. • "Lincoln Yards" Some 70 riverfront acres between Bucktown and Lincoln Park, including the former Finkl Steel site. It "offers robust, existing and multimodal transit connectivity, fiber rich infrastructure, a reasonable cost of living, vibrant neighborhood adjacency and immediate development opportunities with future expansion options," officials said. • "The River District" Anchored by 37 acres of continuous riverfront land along the river and Halsted Street the site is "located at the confluence of Chicago's most dynamic office, residential and entertainment districts," officials said. It "represents an opportunity to create a new neighborhood that is pedestrian, bike, and transit friendly, while also convenient to regional commuters and international travelers," according to the statement. The Tribune Freedom Center is located in the district and Tribune Media has proposed more than a dozen new buildings and 5,900 new homes. 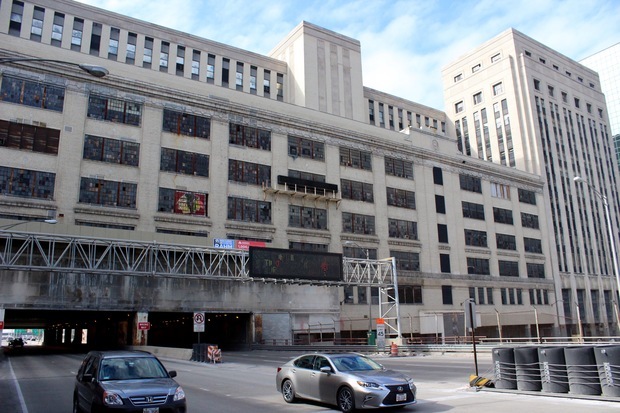 • "Fulton Market" A "21st Century extension of Chicago's Central Business District" the former meat-packing district "is now a rich mix of office, workspace, restaurants, night-life, hotels and housing intermingled with industry, makers and artists," officials said. The Near West site is home to Dyson, Glassdoor, Google, Uber, McDonald's and WeWork. • "The Illinois Medical District" Within walking distance to "authentic Chicago neighborhood experiences" like Little Italy and Greektown, and minutes away from the city's business and cultural center, officials said. Dr. Suzet McKinney, the CEO of the Illinois Medical District, said in a statement that the property on the Near West Side "is the ideal place for Amazon." "With two universities, four medical centers, research facilities and a tech park, the [medical district] will attract future generations of diverse, global talent," McKinney said. • "The 78" The 62-acre South Loop site is was announced as the site of the University of Illinois Discovery Partners Institute Thursday, a collaboration of research universities, businesses and public-sector partners designed to spur growth in the Illinois economy. Disgraced developer and political fixer Antoin "Tony" Rezko once received city approval to build as many as 4,500 homes on the site but eventually lost the property. • "Burnham Lakefront" The former Michael Reese Hospital site extends from McCormick place to 31st Street Beach and Marina includes a half mile of Lake Michigan frontage. With 12 million square feet of mixed-use development, the site has "existing infrastructure for direct and secure fiber connectivity, with unparalleled data capacity utilizing renewable energy and a district micro-grid," officials said. • A Schaumburg site that served as the global headquarters for Motorola for over 50 years. • The Oak Brook site that McDonald's is leaving. 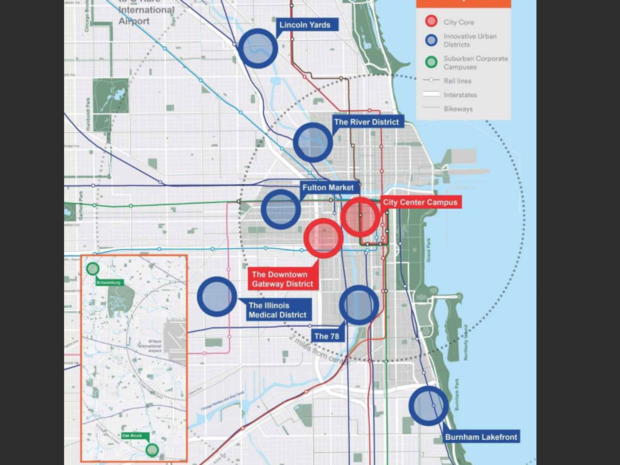 "The combination of these prime locations with the country's most educated population, diversified economy and connected transportation system make it clear that Chicago is the ideal city for Amazon's second headquarters as the company continues to expand," Emanuel said. Rauner said Amazon would thrive in Illinois. "Our state possesses unmatched business, education, technology, logistics, distribution, and academic research assets," said Governor Bruce Rauner. "More important, they represent a foundation for talent rich, innovative growth for generations to come."